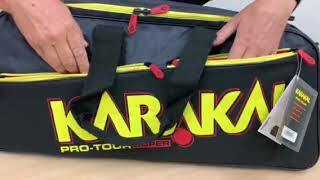 The Pro Tour Super measures 75x32x18cm and is designed to fit 6 rackets. It has a separate racket compartment and zipped pockets in the side for valuables. It also comes with a separate bag for your shoes and is fitted with a shoulder strap and carry handles.